Kaukulaelae Historical Tour – This 40-minute tour, offered on Tuesdays and Thursdays at 11am, is the best way to see the remnants of Kaukulaelae along the Keauhou Bay shoreline at Sheraton Keauhou Bay Resort & Spa. Holoholo Keauhou Tour – A unique opportunity to learn the rich history of Keauhou during a 1.5 hour hiking tour along the Kings’ Trail to historic Lekeleke burial grounds where the Battle of Kuamo’o took place – Tuesdays and Thursdays at 8:00am. Manta Talks – Organized by Fair Wind Big Island Ocean Guides and Sea Paradise, these manta ray presentations are held at the manta ray viewing area adjacent to the Sheraton’s Manta Ray Bar & Grill each Monday through Saturday evening, just after sunset. 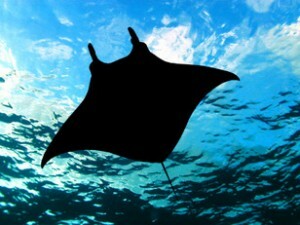 Watch manta rays feeding (almost) nightly! Greenwell Coffee Farm Tour – Tour Kona coffee fields and processing facilities, enjoy samples of various coffee products, and see a working Hawaiian farm. Depending upon the season, you will see and learn about each stage Kona coffee production. Kokua Kailua – Kailua Village BID hosts a monthly Kokua Kailua when Alii Drive is turned into a pedestrian only marketplace from 1pm-6pm. Shop, dine and buy local! Keauhou Trolley – Hop aboard Keauhou Resort’s Trolley to Historic Kailua Village with stops at Kona resorts, Magic Sands Beach Park, Kailua’s Pier, Kona Commons Shopping Center and numerous spots in between. Oceanside Yoga – Offered to guests at Sheraton Keauhou Bay Resort & Spa on Monday and Thursday mornings at 8:30am. Experience this yoga session in the beautiful and tranquil setting at the Bayview Terrace. Mats available.